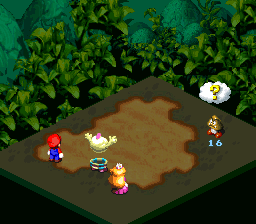 Psychopath is a special technique that Mallow learns in Super Mario RPG: Legend of the Seven Stars. The skill allows Mallow to view an enemy's current HP level. If the player can push right before the two lights converge on the enemy, Mallow will also be able to read the enemy's mind, revealing an amusing (and usually nonsensical) quote. Occasionally, this mind probe reveals a weakness or even more rarely a revelation of further plot points or a point of character development for the enemy in question. Mallow learns Psychopath when he reaches Level 6. This ability uses one Flower Point (FP). This technique has no Magic Power rating, since it does not actually damage the enemy or heal the party. Psychopath can be thought of as the predecessor of the Tattle ability from the Paper Mario series, which reveals HP and actual tips. Nani Kangaeteru no Whatcha Thinking? This page was last edited on March 5, 2019, at 16:42.